Visit & tour the WW II Oil Storage Tunnels. Onto the Defence of Darwin Museum and the story of Darwin’s role in WW II. The interactive Museum provides an opportunity to understand the impact of the war on Darwin and its inhabitants. 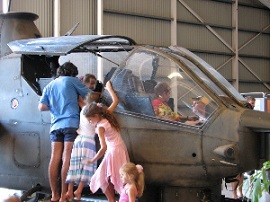 The Australian Aviation Heritage Centre has an impressive presentation of aircraft and displays depicting the Territory’s involvement in aviation, both civil and military, from the early pioneers and record breakers through World War II and the jet age. The major display item is a massive B52 on permanent loan from the United States Air Force and is one of only two on public display in the world outside the USA.